I generally avoid getting up on political soapboxes; it's a bit wobbly up there and I get vertigo. But I'm going to say something about the shootings in Arizona, because I think it's important. I'm going to say it briefly, and I'm going to keep my feet as close to the ground as possible. A lot of mud has been slung over the past few days about the language and political climate that preceded Saturday's terrible events. 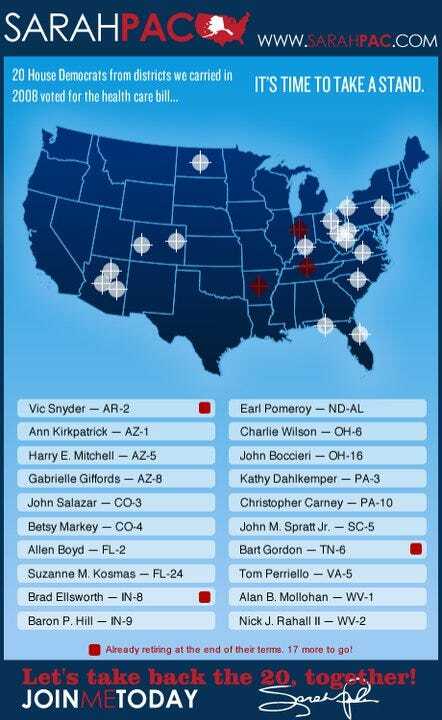 In fact, the first I learned of what happened was in the context of an article condemning Palin for her now-infamous map. It's frustrating. This blog from the Village Voice, for example, blames "rightbloggers" for using the tragedy to paint themselves as victims at the hands of the left. But couldn't the same be said of those who have used the tragedy, in a sense, to condemn the right for their rhetoric? Jon Stewart, always considered and articulate, makes a good point in his speech that I'm sure by now we've all seen: we have to be able to understand the difference between our political opponents and our enemies. There is a difference. This is not really a bipartisan issue. There is a difference between the rhetoric of Keith Olbermann and Glenn Beck. There is a difference between the level of institutional courting and entrenchment of left wing loonies and right wing loonies. I take his point, but even so, I say it IS a bi-partisan issue. Yes, the boderline violent, gun-culture rhetoric that has gotten everyone so amped this week is much more the domain of the right than the left. And, yes, I do think such language is inappropriate, and the events of this week highlight the fact that there is a terrible reality attached to these words that is often considered too lightly. Republicans are apparently unfeeling, war-mongering, gun-toting, money-grubbing, tar-hearted individuals who will do anything to make sure they keep what they have and everyone else can rot. And Democrats... well, I'm not sure what, specifically, the Republicans like to say about us Democrats (as I keep mostly liberal company), but I know it's just as bad. But, honestly, could it be much worse? It all creates a climate of Us vs. Them, of Good vs. Evil. And all this within the borders of our own nation, a nation built on the the idea that political discourse and differing idealogy will only make us stronger. This kind of vitriolic side-taking and blame-dumping is not only fostering a climate of anger and hatred, it's unproductive. We, as a government AND as a people, are ignoring simple facts and common sense, so blinded are we by the larger objective of Opposing The Other Side. 1. Loughner purchased his weapon COMPLETELY LEGALLY. 2. A federal assault weapons ban that expired in 2004 prohibited the sale of gun magazines holding more than 10 rounds; Loughner's held 30 rounds. 3. Loughner was finally taken down only when he paused to reload - after 30 rounds. I'm not a big gun person. I'm actually not 100% sure what a "magazine" is, or a "round" for that matter. (Is it a bullet? Is it a series of bullets? Don't laugh). What I do know is this: had this particular piece of gun-control legislation still been in place, Loughner would have only been able to fire ONE-THIRD as many shots from his legal weapon before being taken down. Would one-third of the lives that were lost that day, then, have been saved? I don't know, of course, no one can. And while I am in favor of gun control as strict as the most flexible interpretations of the 2nd Ammendment will allow, and I DO think that lives would have been saved this week with more rigorous restrictions, I'm not here to make that point. I'm here to ask the question: why aren't we talking about it? This is the kind of dialogue that this tragedy should foster: How did this happen? How can it not happen again? It's not even simply the question of whether or not that particular assault weapons ban should have been allowed to expire, or whether it should be reinstated - although those are good questions. There's also the larger question: How on earth was a mentally unstable 22-year-old able to to get a hold of this gun at all? Is there a way to be a little more thorough, a little safer with how we distribute firearms? Is there a way to prevent this from happening again? I just want to know why nobody is asking the question. Sadly, precious little is being said about this event as it relates to gun control. Long-time gun-control advocate and Congresswoman Carolyn McCarthy told the Huffington Post, "I know what I can get passed and I know what I can't get passed. And if I wanted to get something symbolic -- and we are going to reintroducing the assault-weapons ban and that's wonderful -- it won't go anywhere. It won't even get to committee." Creating a stronger, safter society as a result of this tragedy - a thing that might make meaning out of these untimely deaths - is being ignored because that's not what we as a nation have decided that it's About. The Palin angle, that should be a side story at best. No, I'm not a big fan of her gun-saturated language, but as The New Republic pointed out, people - normal, sane, rational people - use gun-related metaphor and imagery all the time. It's not the story here. But instead of considering the actual story, we're caught in this cycle of political impotence, so preoccupied with hurling invective from Left to Right that we can't stop to discuss the real issues, even when it is so devestatingly demonstrated to us that real human lives are at stake. That's all I have to say for now. I'm feeling a bit woozy. Hate speech on the left, hate speech on the right, the saving grace of our Democracy is we know wrong from right. Extremists on the left are the same as extremists on the right. All you can do is call them criminals when words fail to convey their hatred to the world and they resort to actions that maim and kill. It is at he heart of darkness in our human nature, the animal in us that we through our art seek to identify and tame. What worries me, though, is that I hear this highly polarizing speech not just from extremists and criminals from normal, respectable, thoughful people. I wouldn't call it hate speech, but (to paraphrase Stewart again) it IS getting harder to tell. And when the normal, sane stuff start sharing things in common with the crazy radical stuff, that's where it gets problematic.